Plug In Some Guitar Pedals! Modular and analog synthesizers have a certain seductive aura. Buttons, knobs, inputs and outputs galore – there’s something irresistible about them. If like me, you’re a guitarist who’s equally fascinated and terrified by the prospect, chances are you wouldn’t know what to do with them if you got hold of them. On the other hand, you might be a keys player, producer or DJ who’s intrigued by modular. You may be well accustomed to using synthesizers, but you may also like the idea of expanding your sound and making your setup more interactive. Either way, the possibilities are borderline-infinite when it comes to modular synths. In this article, we’ll explore some of the things these gadgets can do to expand your creativity! Though this may be stating the obvious, most instruments need to be played to be heard. Guitars need strumming, keys need pressing, drums need thumping, and so on. Further to that, there’s tweaking that’s required to find your sound when performing, whether it’s stomping a pedal, changing your keyboard patch or switching to brushes. It can be difficult to strike a balance between the two, and it often takes years to perfect. While modular synths can also be played (via a keyboard controller or MIDI input), there’s an alternative; sequencers. As the name suggests, these units allow you to create a sequence of input signals on a loop. Program a melody, a bassline, a series of ambient notes, or a drum beat – many sequencers allow you to tweak repetitions, save and load your sequences, choose a musical scale to adhere to, and much more. 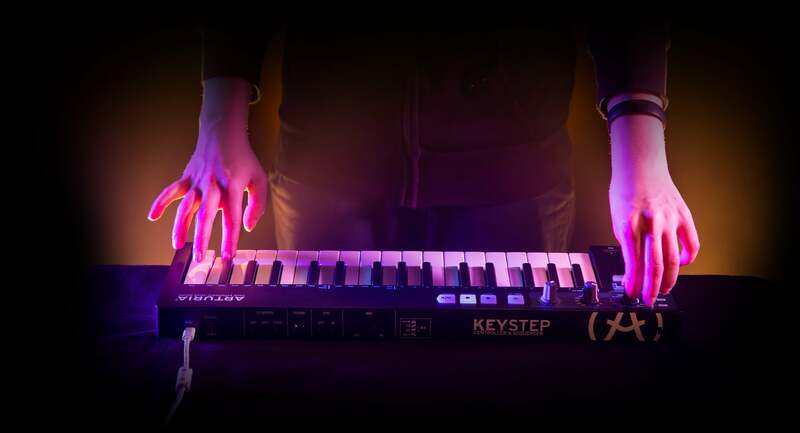 (above) The Arturia KeyStep is one of the most popular and intuitive sequencers available on the market – it comes in the form of a mini keyboard. Arpeggiators are an extension of this, taking whatever notes are inputted (again, from a keyboard or another input source) and repeating them in whatever pattern you see fit. This gives pad sounds movement, it adds momentum to your mix or just makes for a cool abstract texture. Brands such as Arturia, Intellijel and Roland make excellent sequencer units for a number of applications. You can tweak sequencers as you go, or allow them to loop freely – either way, the sequence starts and stops when you tell it to. This frees you up for endless sonic exploration! Part of the beauty of the modular synth concept is the endless control you have over pretty much any parameter. Waveform, pitch, modulation, the works. But arguably one of the most diverse elements of a modular patch is the envelope filter. This controls the attack, decay, sustain and release of your sound – commonly referred to as ADSR. Tweaking your oscillators and envelope filters in conjunction can allow you to create all manner of sounds – if you roll back/tweak all four envelope filter settings, your synth’s tone adopts a punchy, percussive character. This allows you to create unique, raw and powerful drum sounds that are bound to put a smile on your face. Better still, play around with patching and add a sequencer to the mix. As mentioned earlier, a sequencer will allow you to unleash rhythmic loops so you can concentrate on contorting your synths beyond recognition. Moog have saved you a few steps by creating a desktop semi-modular synth that specialises in percussive sounds: the DFAM. If you’ve been looking for a fresh percussive take on your performances or compositions, analog and modular synths might just be what you’re looking for. As mentioned earlier, modular synths provide total control over your sound. While this is a rare opportunity for endless exploration, it can be difficult to know where to start, and harder still to familiarise yourself with the infinite number of functions. A good place to begin might be to copy some of your favourite synth sounds. Gary Numan, Aphex Twin, Faithless – the list of memorable, weird and downright iconic synth sounds goes on and on. Picking some favourites and attempting to replicate them makes for a great learning curve. It’ll provide a clear goal that’ll help you become accustomed with your setup. 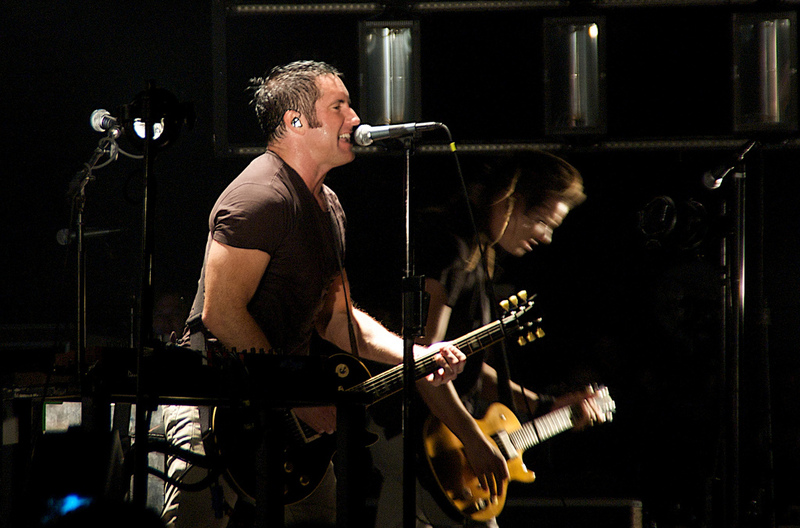 (above) Trent Reznor is a prolific user of synthesizers, both with Nine Inch Nails and his solo work – a great place to start when looking for synth inspiration! It’ll also change the way you hear sounds. Synths produce musical tones and percussive hits, yes – but there’s an in-depth process, a science behind it. By starting from scratch to replicate your favourite tones, you’ll learn to listen out for characteristics that’ll help you identify methods going forward. As they say: practice makes perfect! 4. One for Guitarists: Plug In Some Pedals! Yes, your modular setup already has massively expansive potential in terms of tone. But what’s stopping you from taking it a step further? Modular synths are designed to be inter-connectable, but there’s no harm in experimenting with external elements of your setup. Modular synths could be regarded in a very similar way to guitar pedals. The two categories were separated at birth, both rooted in analog technology and both allowing personalisation of your sound. In this case, a family reunion could yield some weird and wonderful results. As covered in our article ‘Using guitar pedals with a synth’, the meeting of these two concepts is a natural process. It’s meant to be. As long as you consider line level & impedance (covered in the article), adding pedals to your modular setup further expands your tonal palette. Does the fun ever end? This point arguably encompasses all of the previously mentioned points. But then again, it applies to the concept of analog and modular synths as a whole. If you go full modular (Eurorack-style), there’s very little about your setup that’s pre-determined. It’s totally up to you to make noise – in this respect, you’re almost building your own instrument. Imagine having a selection of guitar necks, bodies, pickups and string gauges that you could instantly interchange at the flick of a switch or the tweaking of a cable. It would totally change the way you approach your instrument, naturally. That’s a big part of the value of modular synthesis – it requires a different approach, a different mindset. As well as this, it’s your choice whether you want to play by the rules. Analog waveforms don’t abide by the rules of chromatic pitch or metronomic tempo. While these confines form the basis of the universal language of music, breaking from them can be a breath of fresh air – though it’s not everyone. But hey – rules are meant to be broken, right? Did you enjoy this article? You might want to check out our other learn articles while you’re here! And while you’re at it, you can read our Ultimate Guide To Modular Synths here, and check out our full selection of synthesizers here. Enjoy!